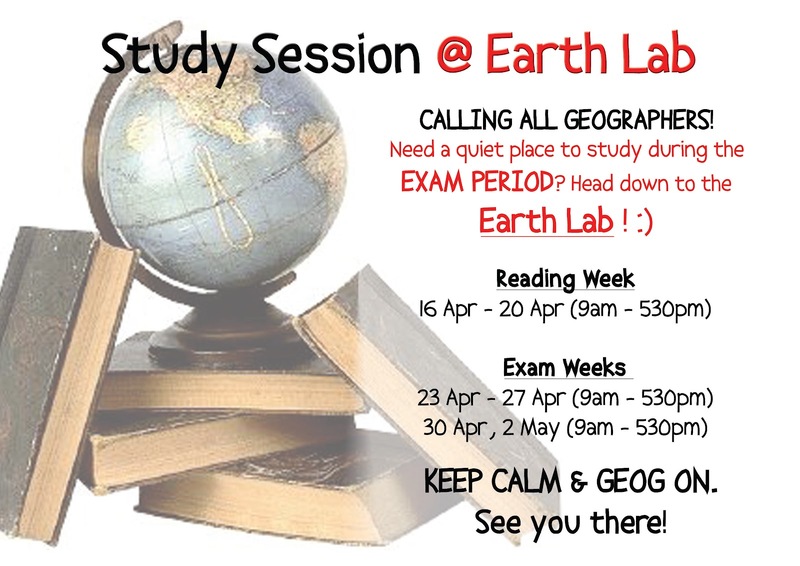 With the kind approval and support from the Department of Geography, the Earth Lab will be open for studying throughout the examination period (date and time reflected on the poster)! 1. Geography Majors & students reading GE1101e only. 2. No reservation of seats allowed. 3. No food and drinks allowed in the Earth Lab. 4. Noise must be kept to a minimum. 5. Geog Soc will not be responsible for any missing belongings. So, grab your books/readings/laptops and come down to the Earth Lab for an alternative place to study! Note: For Majors who have yet to collect your copy of Geosphere and mug, please come by the Earth Lab during the Reading Week (weekdays) from 9am to 5.30pm to collect them.